If you walk around central Vienna, you will find innumerable examples for Baroque city palaces - compact ones in the first district, extensive ones with parks in the Vorstädte (today districts two to nine). 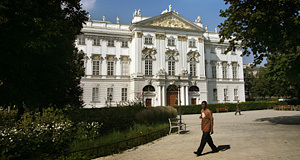 To learn more about the history and significance of these buildings, read my article on the Palais of Vienna. One of the most important of these palaces is the Palais Trautson. You find it if you pass the MuseumsQuartier and the Volkstheater - on your left hand side, just behind the Justizpalast. It is situated by the Lastenstraße, a supply road that parallels the Ringstraße. The Lastenstraße allowed carriages to deliver goods to the palaces of the nobility without disturbing important traffic on the splendid boulevard of the Ring. The Palais Trautson is used by the Ministry of Justice (Justizministerium) as a headquarter. It is named after Countress Margareta of Trautson, who owned the suburb of St. Ulrich (now part of the seventh district or Neubau) since 1657. A small section of the grounds was occupied by a house, but most of it was covered with orchards and vineyards. House, orchards and vineyards were destroyed in the course of the second Turkish Siege of 1683 - not unusual, this happened to most of Vienna′s surrounding towns and villages. It literally flattened the area and allowed a building boom period that followed the Habsburg victory. During this optimistic period of Baroque expansion, the statesman Count Johann Leopold Donat (pronounced like Doughnut) of Trautson did what many wealthy noblemen of his days did: He hired renowned artists and gave orders to erect a palace according to designs by architectural superstar Johann Bernhard Fischer von Erlach. The Palais Trautson was built in 1712, immediately turned into one of Vienna′s fanciest buildings and followed the design of the Amsterdam city hall. The gardens - a key feature to every decent palace of the Baroque age - were designed by Jean Trehet. Its outlay is very unusual: In almost all Palais of Vienna′s suburbs, the garden was behind the building or - if there were two buildings - between the main one and the smaller (see for example Schloss Belvedere Palace). Due to a lack of space, the gardens of Palais Trautson were arranged to the right of the building (if you are facing it). Palais Trautson became almost instantly a very popular as a ball venue, gambling hall, shag shed and generally a place for courtly Baroque leisure. It had soon earned itself a rather legendary reputation. In 1760, Empress Maria Theresia - still seen as something like a mother of the nation - purchased Palais Trautson for 40,000 Gulden. Continue with "Palais Trautson - Part II"